Arrived in Athens around 9 a.m., Monday (August 2008). The taxi dropped us off at Hotel Central in the Plaka district. The block we were on was full of shops selling Greek Orthodox icons and black clerical clothing. It was unbearably hot. 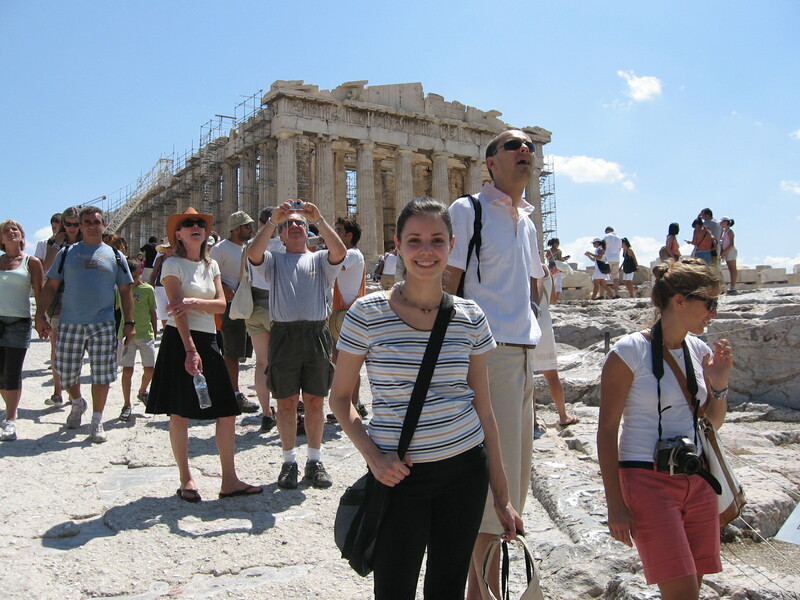 We immediately set out to find the Acropolis, even though we had gotten almost no sleep during the flight. As we made our way to the Acropolis, we walked through the Plaka and passed by the Roman agora. Surprised by the number of stray dogs and cats everywhere. All the dogs were passed out in the sun. They looked dead. All the shops in the Plaka – and, as we would later find out, most of Greece – are exactly the same. 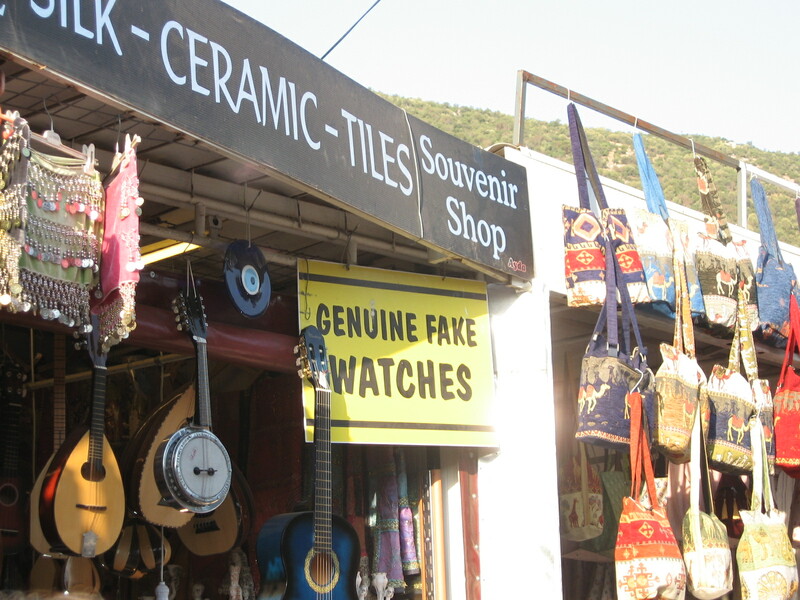 They all sell worry beads, magic eye jewelry, fake pottery, postcards, cheap bags, T-shirts, olive oil soap, and olives. It’s amazing they can stay in business at all. We gradually made our way to the Acropolis. Surprised by lack of signs. We saw one crudely made handwritten sign with an arrow, but that was about it. 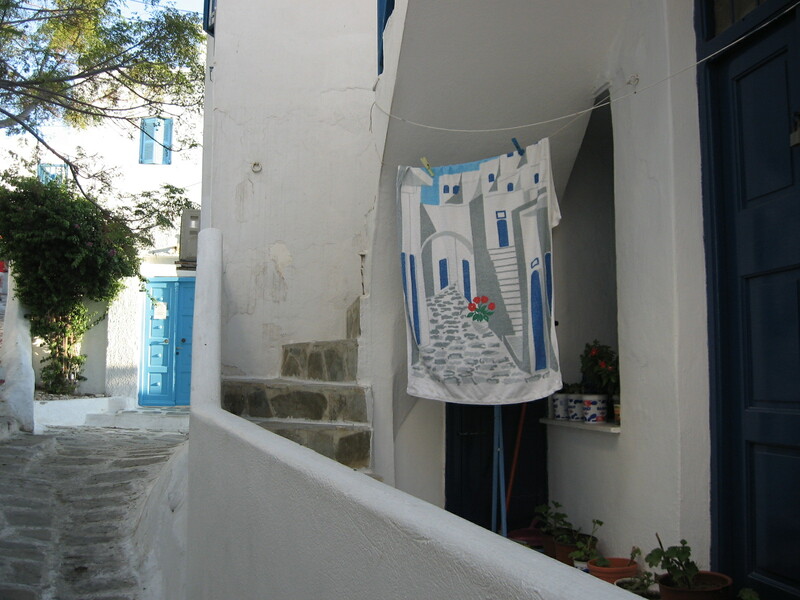 We passed through a neighborhood that resembled a Cycladic island, whitewashed with blue paint on the doors. It would have been cute except for the litter and sickly-looking animals. Finally reached the entrance to the Acropolis. We paid 12 euros for a ticket that also gave us access to other archaeological sites in Athens. We climbed up the steps in the heat of the middle of the day. The Parthenon was breathtaking, as was the Erectheion with the caryatids. I couldn’t believe I was actually there. Too bad there was scaffolding covering practically everything. Had a panoramic view of Athens. The stone on the ground was dark red and very slippery. There were pieces of the building scattered all over the site. After seeing the Acropolis, we used our tickets to see the Athenian agora, then the Roman agora, then the Temple of Olympian Zeus. The Athenian agora was large and impressive, the Roman agora not as much. I wasn’t that impressed by the Tower of the Winds. 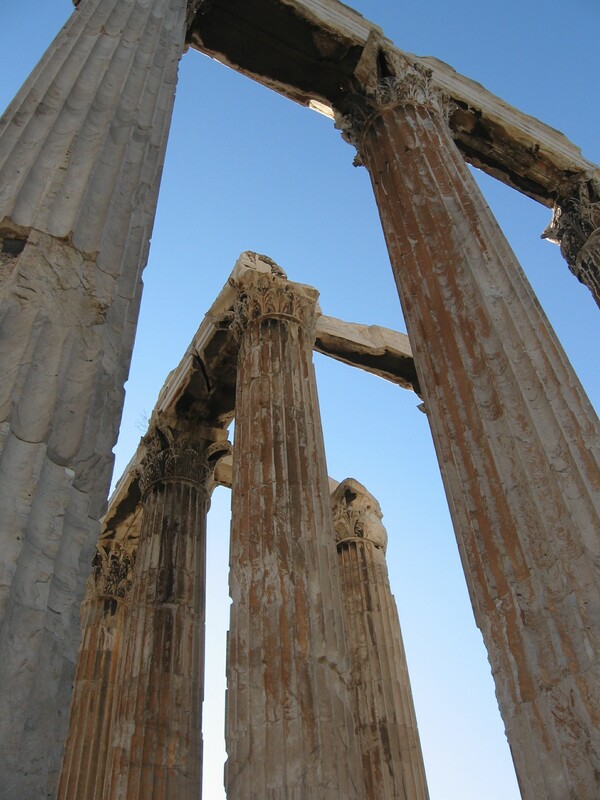 The Temple of Olympian Zeus was amazing, especially the part with the fallen column. There were dogs everywhere. We couldn’t figure out why there were so many strays. The Hotel Central is modern, but our room was very small and the bathroom even smaller. Plus the bathroom had a frosted glass door that was open on the bottom and a frosted glass wall that faced the bedroom, which is just wrong. The hotel had a roof terrace with a whirlpool and a view of the Acropolis. On Tuesday we went to the nearby Hotel Arethusa to wait to be picked up for our three-day Classical tour. Of course there was a yellow dog in front of the hotel, which kept running after motorcycles and making us nervous. But on the whole the stray dogs we saw were very calm and almost seemed drugged. I guess they try to move as little as possible in the heat. Our tour guide was called Angela and we later found out she had been born in the 1920s. She was very spry and coherent, though. She gave the tour in English and Italian, since there were a lot of Italians in our group. Our bus passed by the Temple of Poseidon and Tiryns, I think. Our first stop was Corinth, where we saw a ship passing through the canal. Only one ship could go through at a time. There were olive trees everywhere, kind of like Spain. 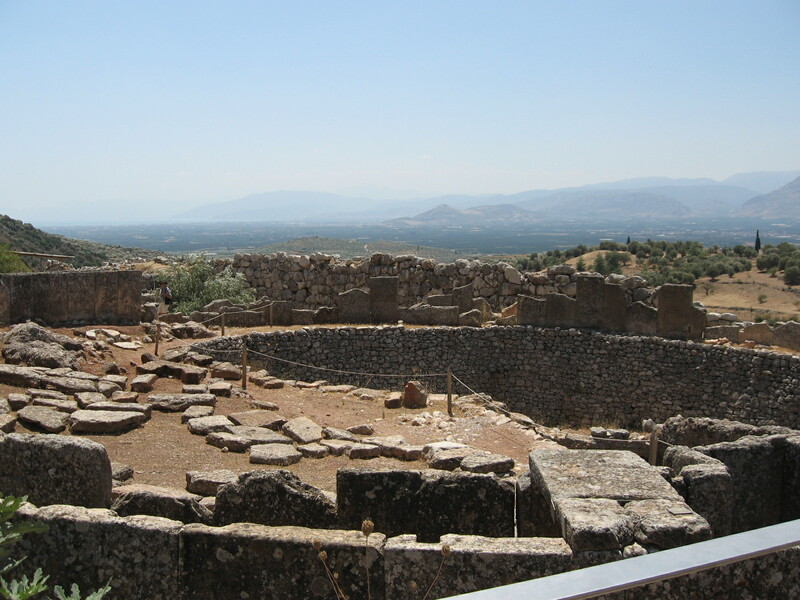 Next we stopped at Mycenae, which was amazing. It was hard for me to take it all in. Saw Grave Circle B, Grave Circle A, Lion Gate, megaron, etc. It was extremely hot and we had to rush through it because our time was so limited. In all the sites we visited I was struck by the mixture of languages — Italian, Spanish, German, and Greek of course. Also lots of Australian and some British accents. After Mycenae we stopped at the nearby King Menelaos restaurant, where the menu offered only heavy, traditional Greek fare. The Greeks are not big on air conditioning and we sat outside on a porch, where we at least had some shade. I think I got yogurt with honey, which was very, very good. They gave us small fresh grapes and watermelon for free. They served our tables one by one, so it took a while for us to get our food. The food was good but the service was strange. Then we continued on our journey to Olympia, where we were staying at the Hotel Amalia, a Greek chain. The room here was much bigger than the one in Athens, though kind of dated. It had a nice swimming pool. We went to the buffet in the hotel for dinner, which was actually pretty good. We sat next to a nice Mexican couple who spoke several languages fluently. I think the man was a lawyer. He said his son owns an Italian restaurant in Mexico City, and that we should visit if we were ever in the area. Later we went out to sit out by the pool, where we saw bats flying overhead. On Wednesday we went to Olympia. The site is covered in ruins, statue pedestals, and fallen columns. 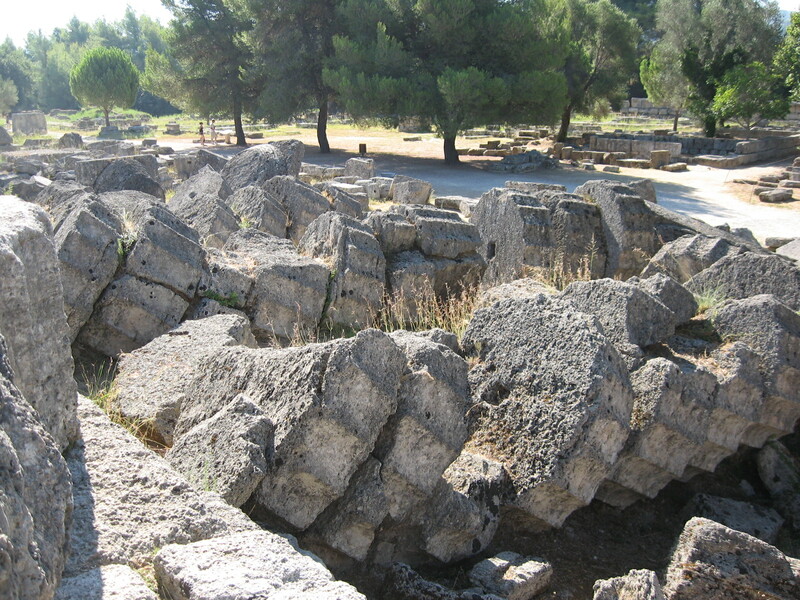 Saw the site of the Temple of Zeus, which has one reconstructed column and some of its mosaic floors still intact. The column drums are massive and heavily eroded. We saw the spot where wreaths were awarded to the winners. Then we went into the stadium and took our pictures at the starting line. Some people actually did run all the way around, in spite of the intense heat. The ancient Greeks ran in the morning, before it got too hot, presumably. Then we went to the Olympia museum, which had many of the statues from the pediments of temples at Olympia, and the Hermes of Praxiteles. It was really crowded in the museum because it was overrun by tour groups, including some from a Caribbean cruise ship. It got very noisy and I could barely hear our tour guide, who had a heavy accent to begin with. We had lunch in another place with heavy, traditional Greek fare. At first they brought us out prepared food like pork chops and moussaka, but then we asked to see a menu and got salads instead. I can’t imagine the average Greek eats this kind of heavy lunch very often. 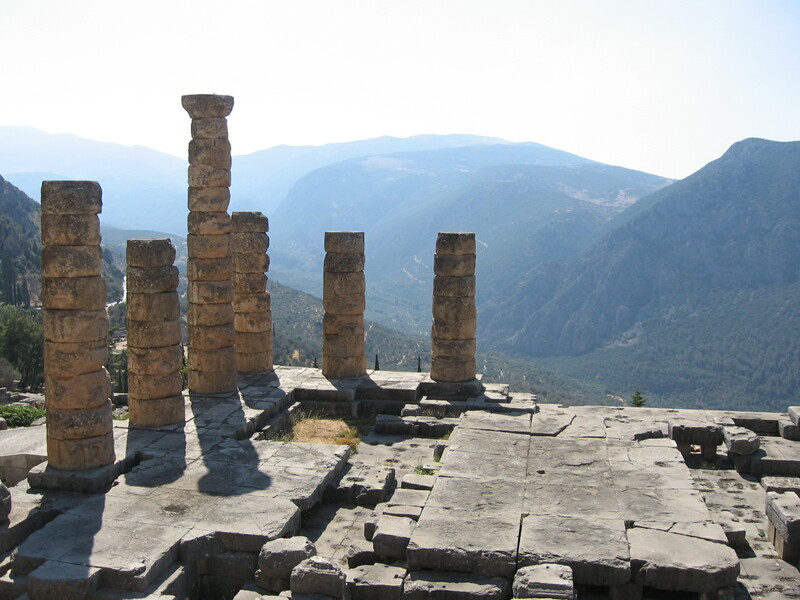 We then drove on to Delphi, where we were staying in another Amalia Hotel. The bus had to navigate a number of hairpin turns on the side of a mountain to reach the modern town, which only had two or three one-way streets. The buffet and rooms here weren’t quite as good as the last Amalia’s. We had an excellent view of the mountains around Delphi, though. We watched the swallows swoop down and drink water from the pool. That night we walked around the modern town of Delphi, which is tiny, with two or three steep roads. I bought some olive oil soaps with glass eye magnets glued on them. There were some nice restaurants with great views of the mountains and the same kind of touristy shops we saw in Athens. We saw a pregnant woman and wondered what would happen if someone had a medical emergency there, since the town is so remote. 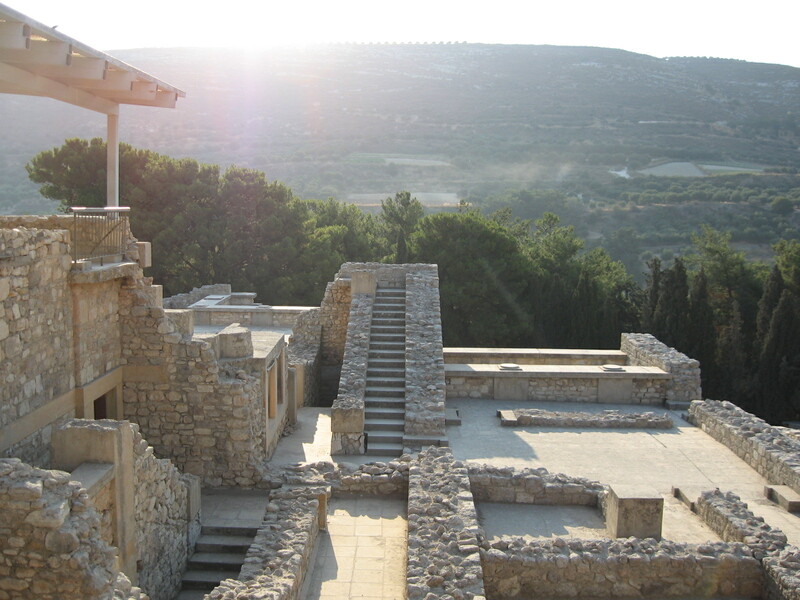 On Thursday we went to the museum and archaeological site of Delphi. The museum has some very impressive pieces, including ivory and gold statues of Artemis and Apollo, the omphalos, and the Delphi charioteer. I tried to have a picture taken next to the charioteer but they don’t allow posing, I don’t know why. Then we went to the archaeological site and walked up to the Temple of Apollo. There were a lot of swallows flying around the columns of the temple. It was an awe-inspiring sight. Then we walked all the way up to the stadium, which was closed because of the risk of falling rocks. It was a hot, exhausting walk, but had spectacular views. Those ancient Greeks must have been very hardy. The oracle is in such a hard-to-reach spot, in the middle of the mountains, and it’s so hot and dusty. I guess that added a sense of majesty to the place. After we had climbed to the stadium, we went to the Temple/ Tholos of Athena, which is outside the gate to the archaeological site. An Italian woman from our tour trailed along, though we couldn’t communicate very well. That was the end of our three day Classical tour. Most of our group was continuing on for the four-day tour, which included a trip to Meteora. The bus dropped us and the rest of the people returning to Athens off at the Amalia Hotel, where we had to wait about two hours for a tour bus heading in the opposite direction. We spoke to a nice young Australian couple from our group while we waited. They were shocked that Americans get so little vacation time, while Australians generally have a month or two off. They had done a Louis cruise prior to this tour and liked it. They went on and on about how the unlimited drinks package wasn’t worth it. Finally a bus came and we waited for the tour guide to call our names, as Angela had said they would. But the tour guide just stood there chatting to some other tourists, so we hopped on the bus without further ado. We later overheard the guide saying that she was from Crete but was married to a Japanese man. The bus stopped at a more traditional Greek town on the way back from Delphi. It was much larger than the town we had stayed in the night before, but we only had about ten minutes there. We didn’t trust the tour guide to make sure we were on the bus before taking off, so we didn’t stray very far. It’s a ski resort in the winter and specializes in fur. Went back to Athens and ate at the Noodle Bar near Hotel Central, since we were getting sick of heavy Greek food. We only saw two or three Asian restaurants during our trip. Afterwards we headed to Syntagma to see the Parliament building. Went into the metro station where there was an exhibit showing what they had found when they were constructing the station, including a skeleton and everyday items from antiquity. We also visited the Hotel Grand Bretagne off Syntagma Square, which has one of the most luxurious lobbies I’ve ever seen. Even here, though, there were stray dogs outside. We were going into the better hotels in hopes of finding tourist brochures, but still no luck. We couldn’t figure out why there were practically no brochures anywhere. We had read online, before coming to Greece, that on August 15 there was to be a fireworks display over the Parthenon for the Night of the Full Moon, but the people at our hotel didn’t seem to know anything about it. The Greek Ministry of Tourism doesn’t seem to be doing a very good job. As we were walking by the Parliament building, we saw three guards dressed in brown uniforms with pom-poms on their boots. All of a sudden they started raising their legs perpendicular to their bodies and stomping their feet as they marched. It was quite a show. 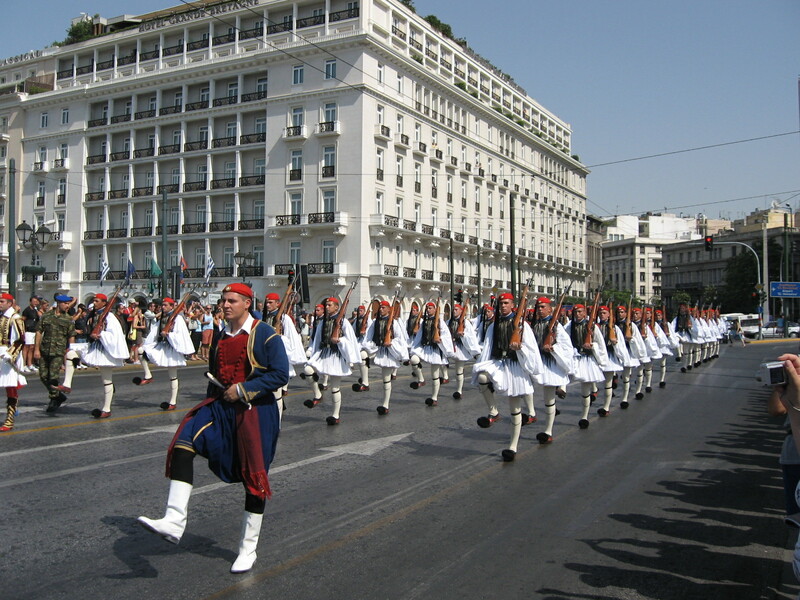 We followed them back to Syntagma Square in front of the Parliament building, where we saw the changing of the guard ceremony in front of the tomb of the unknown soldier. It was impressive, but their movements reminded us of Monty Python’s Funny Walk skit. After the ceremony, the guards had to stand in the heat for an hour and not move a muscle. I had my picture taken next to one of them. On Friday we took the metro from Monastiraki to the National Archaeological Museum. It was a little hard to find – of course no signs. The museum was amazing. It was like a pilgrimage for me. 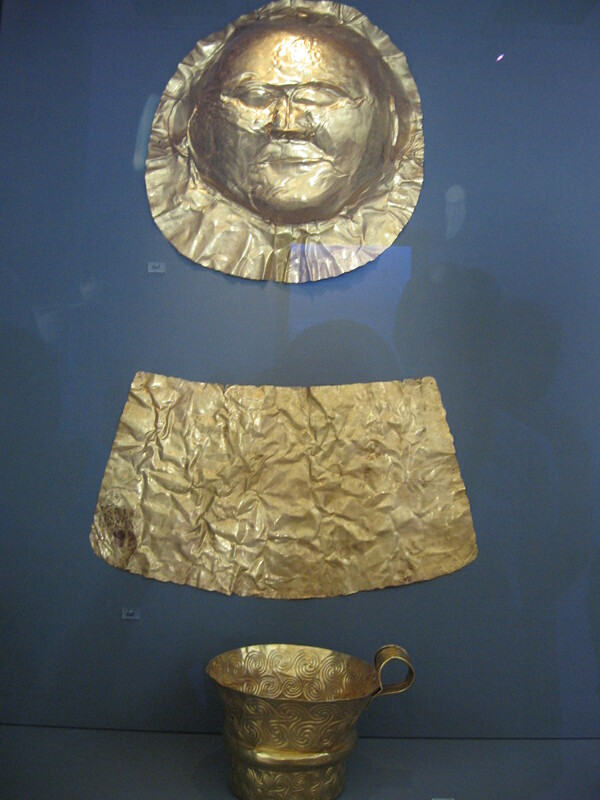 I saw all the Mycenaean artifacts excavated by Schliemann, some of the Akrotiri frescoes (only the boxing boys, the antelopes, and the Spring fresco – I assume the rest are in the Fira museum), Cycladic idols – including one that was almost as tall as I am, bronze sculptures, arrowheads from Thermopylae, classical sculpture and vases, etc. Unfortunately the museum closed early because of the holiday (Dormition of the Virgin), so I had to go through everything a little quickly. The museum ‘guards’ were dressed very casually – a little too casually, in some cases – and spent most of their time chatting with each other and telling people not to touch the glass. After we got back from the museum, it was too hot to do much else. Most of the non-touristy spots in Athens were ghost towns because all the Greeks had left for the holidays. We stopped at a crepe place near Victoria station for a late lunch, but the crepes weren’t nearly as good as the ones in Astoria. We went back to Monastiraki for dinner, to a gyro/kebab place that had a ton of pictures on the wall and looked really popular. We sat in the middle of a crowded street, though, which was not very relaxing. We didn’t know what/how to order. I got Doner pork with pita bread because I kept seeing them carve it off of the spit, but it was terribly salty and fatty. Mom’s chicken was mediocre. We sat next to a young couple from Texas who had just come from Egypt. We had a lot of food left and I asked them wrap it so I could give it to one of the many beggars who had approached me earlier, but I didn’t see anybody on the way back. Side notes: Hotel Central’s breakfast buffet was okay, but not as good as Amalia’s. They had unappetizing wet eggs and limp bacon (as Europeans in general seem to make it), yogurt with honey (my favorite – I had this almost every day), lots of pastries, watermelon, etc. Apples and apple juice were hard to come by. We watched the Olympics on Greek TV throughout our trip. They focused on Greek athletes, though, who on the whole weren’t doing too well. One Greek athlete was winning in ping pong, so they spent a lot of time on that. I was surprised they almost never showed gymnastics, which I was most interested in seeing, I guess because the Greek gymnastics team had already lost. 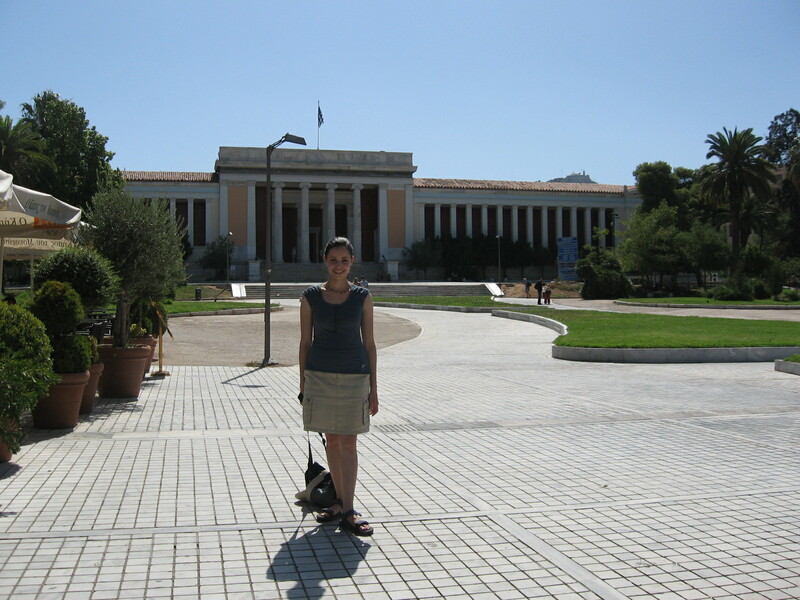 On Saturday we went to the Benaki Museum, which took us some time to find. We were dying in the heat. We walked through the National Botanical Gardens and saw more guards stationed along the perimeter, and stayed for a changing of the guard ceremony there. The park is nice but a bit dull, except for the path lined by gigantic palm trees. The Benaki Museum is a blindingly white building with Benaki’s small private collection of Greek art. It reminded me a little of the Frick. The antiquities were good but not terribly exciting. They had an excellent ancient gold jewelry collection, though. The best part of the museum was the exhibit showing traditional Greek costumes, especially wedding dresses. They were beautifully embroidered, but we wondered how people could wear this heavy clothing in such a hot environment. We also saw an exhibit of early-twentieth century photographs of Greece. We had lunch on the museum’s pretty roof terrace – a sandwich (hard to find in Athens!) and almond cake. We also finally found some brochures on what to do in Athens. None of the booklets mentioned the Night of the Full Moon, though. We walked around the Plaka some more and saw the Acropolis from different angles. We had a delicious Greek salad and chicken kebab in a cute Greek restaurant called the Cave Under the Acropolis, or something like that, in the shadow of the Acropolis. The Greek salad had a whole block of feta cheese on it. It was very pleasant there, though a wasp kept harassing me until the maitre d’ killed it. They seemed to charge us for bread without telling us. In general, I found Greek bread to be dense and tasteless. I was also surprised that in restaurants, they never give you olive oil even though their country is practically swimming in it. We then walked up to the Acropolis. It was the Night of the Full Moon, and the site was free that evening although we still couldn’t figure out if there were going to be fireworks. Most of the people going up to the Acropolis were native Greeks. It was as if they had kept it a secret from the tourists because they wanted the site to themselves. By the time we reached the Parthenon it was almost dark out. They turned off all the lights so that the Acropolis was lit only by the moon. It was very beautiful. I think the Parthenon was more impressive at night than during the day. We stayed for a while and confirmed there were no fireworks, and left as the moon was rising over the Parthenon. I think the site stayed open till 2 a.m.
By Sunday we were a bit tired of Athens, but our cruise didn’t start until Monday so we had to wait around. I think two days is the best length of time to see Athens. It’s kind of an ugly, nondescript city, except for the Acropolis. We walked around the Plaka and bought amber worry beads for Dad from a nicer Greek antique and crafts shop. 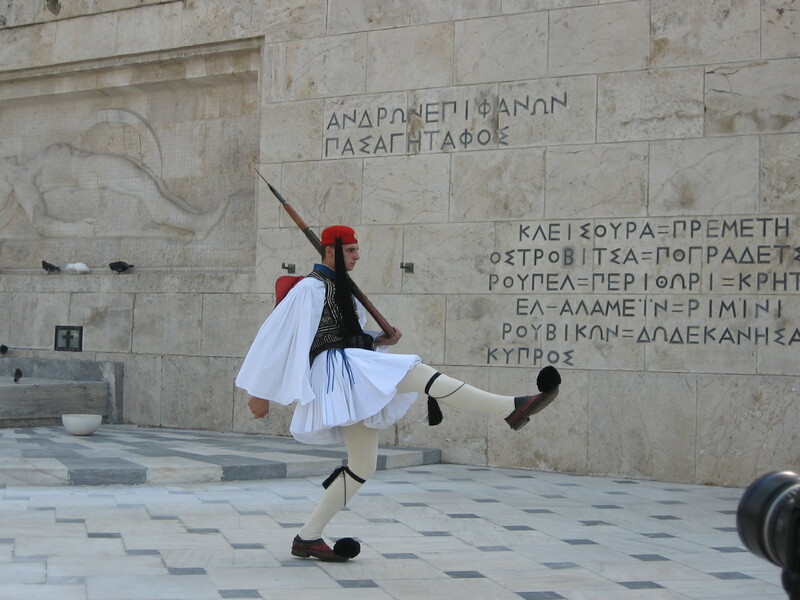 Then went back to Syntagma Square so we could see the guards in the daylight. They were wearing different uniforms because it was Sunday – white skirts and blouses with dark blue embroidered velvet vests, and pom pom shoes. They stood under their awnings without moving a muscle. Sometimes a soldier in fatigues came and wiped the sweat off their faces and adjusted their tassels. Then some policemen started moving the crowd off to the side and across the street. They cleared a huge space, almost the entire square in front of the Parliament building, and we didn’t know what was going to happen. Eventually we heard a band coming and saw them turning the corner followed by a huge body of guards dressed in the same white uniforms with blue vests, walking and stomping their feet in unison. It was very impressive – and unexpected. They were accompanied by the requisite scruffy stray dog, which trotted along at the head of the parade. Once they entered the square, the people rushed in to see them, and we went off to the side because it was too hot and crowded for us to push our way through. They did the changing of the guard ceremony and then left the same way they had come. We went to the Jewish Museum, which was interesting but didn’t have many explanations. To get in we had to press a buzzer of what looked like a private residence, and a guard answered the door and let us in. Saw more of those heavy traditional Greek costumes. There were Romaniote (Greek speaking) and Sephardic Jews in Greece before the Holocaust. There are a little under 2,000 Jews in Athens now, I think. Walked through the Plaka again and were harassed by people trying to get us to eat at their restaurants. Wound up eating in a Greek pizza place outside in the heat. The cheese had a distinctive Greek flavor and was pretty good. Later on I had a frappe in an un-airconditioned Greek café, because everyone was drinking them throughout our trip. It’s basically just iced coffee in a tall glass. It’s strong and gritty, and I didn’t see what all the fuss is about. It was one of the few things with ice in it, though, and it definitely woke me up for a while. Went back to our hotel, showered, and took a dip in the hotel whirlpool facing the Acropolis, but this got boring after a while. Read A Room with a View on the roof. There were no umbrellas on the roof, which was stupid, so we had to use a wall for shade. It was relaxing, though. We went back to the restaurant under the Acropolis and got Greek salads again. On Monday we were picked up at our hotel and driven to Piraeus for our cruise on the MV Aquamarine. Boarding the ship was easy enough, and they took our picture and gave us a boarding card that had to be scanned every time we went on or off the ship. The ship had a photographer who took everyone’s picture whenever we got on or off the ship, so they could sell us these pictures later. Our cabin was small but it had everything we needed. If anything, the bathroom was larger than the one we had in the Hotel Central, and there was no frosted glass door. We had two portholes because we had booked an outside cabin. We were told to assemble at 11:30 in the Aquamarine lounge so the tour director for the English-speakers, Sharon, could give us a run-down on how the ship and the excursions worked. We had to do a few odds and ends like register our credit card, sign up for a dinner time for the nights when we didn’t have buffets (the times offered were 7:30 and 9:30 and by the time we got there the 9:30 one was filled up; the earlier time worked out fine, anyway), and finalize our excursions (we signed up for two more tours, Santorini and Patmos, because it sounded like they were the easiest and most efficient ways to see the islands). After that we had a safety drill where we had to put on our life preservers and assemble on the main deck next to our assigned lifeboats. An employee came and told us to take off our shoulder bags and readjusted our life preservers, making them really tight. Of course the ship photographer came and took pictures of everyone. Last year one of the Louis cruise ships had run aground at Santorini and sunk, so we wondered if that’s why they were doing this drill. The captain walked around the deck and gave his approval, and then we were allowed to go back to our cabins. 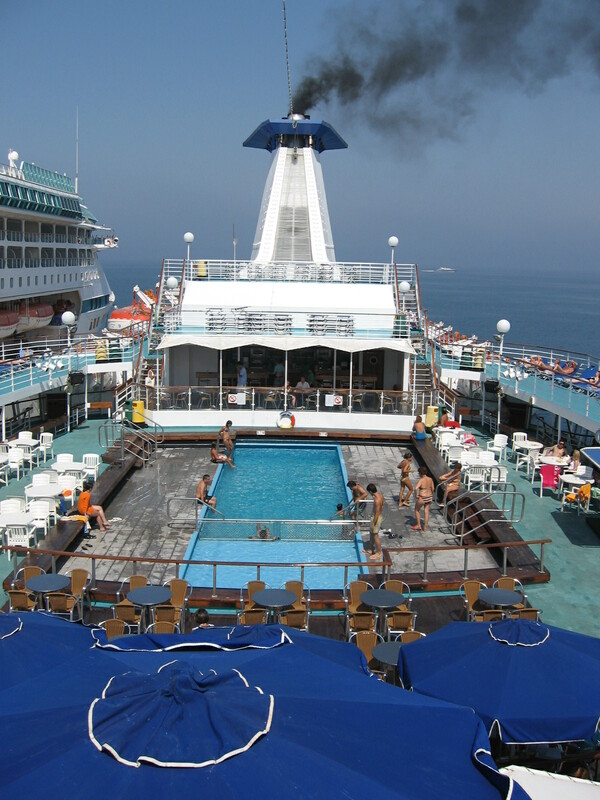 Next we walked around the ship and took a look at the pool on the top deck, which was already full of people swimming and sunbathing and who had presumably skipped the safety drill. We never used the pool because it was too crowded. There were a lot of people sunbathing and getting burned to a crisp. Many of them were overweight and wore tiny bikinis or Speedos that let their stomachs hang out for all to see. We were surprised by how many people were smoking. We tried to find a place to read and relax. It was nice looking out at the water, but none of the lounge chairs had umbrellas, so it was a challenge to find shade. They had a lunch buffet out on deck and one in the Bistro downstairs. The boat headed to Mykonos and we disembarked around 6 p.m. Every time we got ready to disembark we had to go the Aquamarine lounge and wait for Sharon to tell us when we could get off. Most people on the ship were part of tour groups like Trafalgar, Globus and Contiki, and they had their own guides telling them what to do. People going on excursions generally got off first, but we weren’t doing an excursion for Mykonos. When we got off the ship we had to get on a bus that took us to the center of town for seven euros. Mykonos was beautiful. Almost all the houses were painted blue and white, and there were lots of restaurants with tables practically on the water. The first thing we saw were octopi drying on the mast of a beached boat. The shops here seemed much more unique and interesting than the ones in mainland Greece. There were jewelry and craft shops, art galleries, restaurants, some gay bars, boutique hotels, etc. We walked through the residential streets, which were quiet and peaceful. 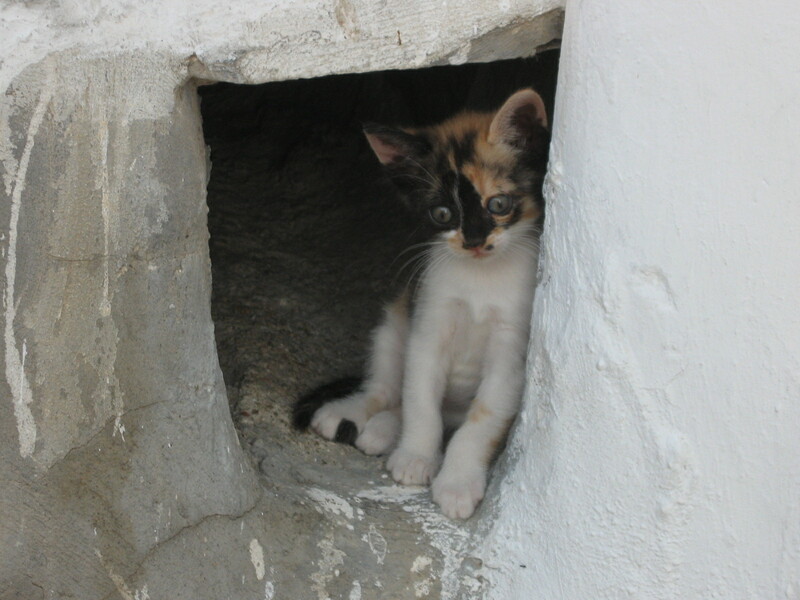 I saw some beautiful cats and kittens, including one mixed-color one that lived in a hole in the pavement and stared at me with the widest eyes I had ever seen. We made our way to the windmills around sunset, where we had a view of Little Venice and the bay full of sailboats and cruise ships. As we were walking through town we saw a white pelican preening in the shade of a cactus plant. We saw another pelican on the beach by the pier, and people were going up to pet it. The pelican didn’t seem to mind, so I went up to pet it too. Its feathers were soft and a bit rubbery. After a few minutes the pelican began to stroll leisurely into town. Around 9:30 we had to get back on the bus that would take us back to the boat. We had a late buffet dinner in the Bistro. On the whole the food was acceptable. The desserts were especially good, and it was hard to stop eating them. We ate so much – they just kept laying out food throughout the cruise. They provided three meals a day, as well as “tea time” and a midnight snack. They had entertainment at night, but we never felt like going. They also had daytime activities like trivia, dancing lessons, a Greek language lesson (which I went to), etc. Ephesus was an impressive site. The marble slabs that made up the ancient walkways were still in place. 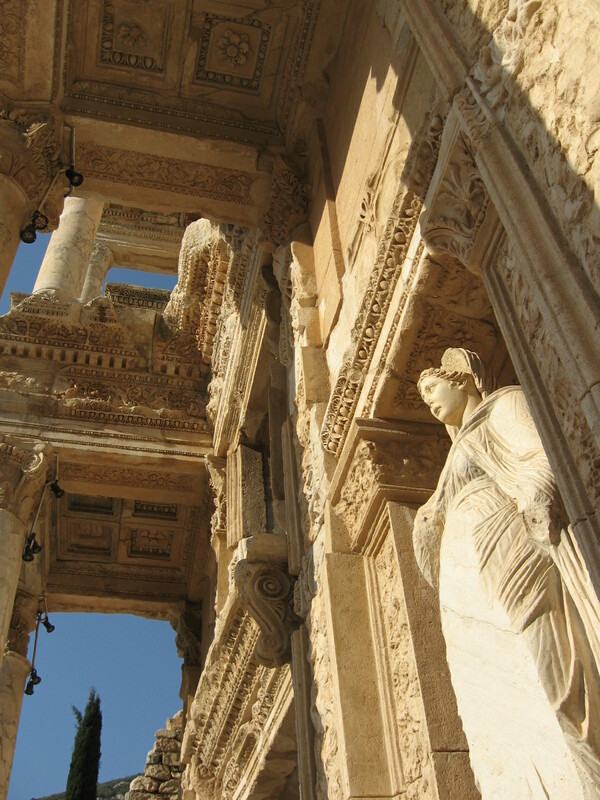 We saw the remains of the Temple of Artemis and the stores where they used to sell idols and offerings, the Temple of Hadrian, the very beautiful Library of Celsus, and the theater. Also saw stray puppies and cats and many ant colonies. Luckily we were there in the early morning (we had left at 6 a.m.), before it got too hot. On the way out of the site we saw some people dressed in Roman-style togas and armor coming into the site, so maybe they had historical reenactments later. After we left the site we were harassed by merchants trying to sell us Turkish delight and postcards. We got on the bus and went back to Kusadasi and were taken to a traditional Turkish carpet weaving place, where they showed us beautiful carpets and explained that the traditional Turkish method of carpet weaving is dying out. They gave us apple tea. It was very much like the carpet store I had visited in Morocco. I didn’t mind seeing the demonstration, but afterwards all the salesmen came out and tried to convince us to buy carpets worth thousands of dollars. We got out of there eventually and went to Kusadasi’s shopping district, where the merchants were even more aggressive. Every time we stopped to look at something, the owner of the store came out and started talking to us. It was getting annoying. I bought some Turkish delight as gifts even though I had never tried it before. We went back to the ship shortly afterwards and continued on to Patmos. There we went on an excursion to the Grotto of the Apocalypse, where John had supposedly written Revelation. In the cave they had put silver around the holes where John supposedly rested his head, where he put his hand to raise himself, and where his scribe had taken his dictation. We walked around the small capital of Patmos (Chora), which had a street with unique craft shops, but couldn’t stay there very long. Then we went down to Skala, the main village of town. This town was very pretty, with whitewashed buildings and bougainvillea. 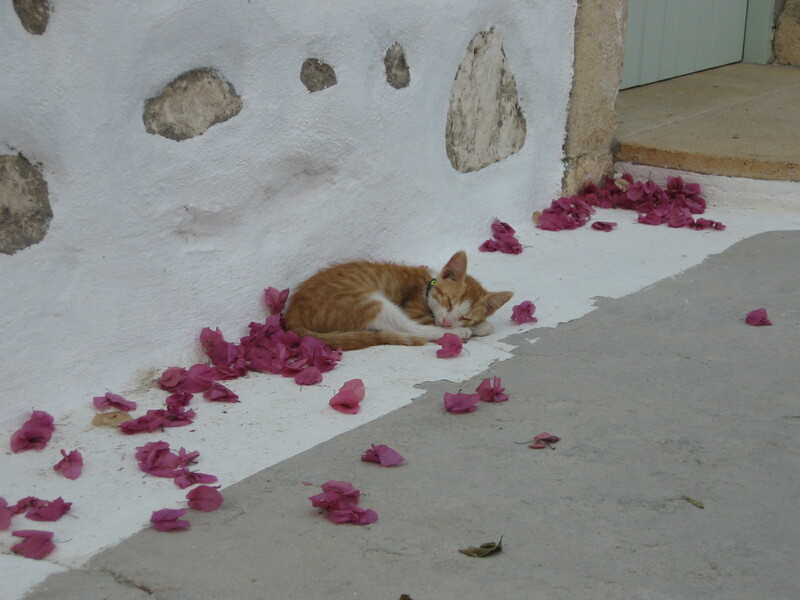 I saw the cutest orange kitten sleeping among the bougainvillea petals and desperately wanted to take it home. I noticed a lot of sea urchins in the water. There were mopeds everywhere, and beautiful yachts. The tour guide gave us a coupon to a café in the town and I had a frappe again, this time without sugar. On the ship that night we had a sit-down dinner and were seated with a Japanese couple who currently lived in Belgium and a Cypriot man and a gigantic American woman who lived in Hawaii. The Cypriot man didn’t stop talking to the Japanese couple about all things Japanese. The American woman was friendly enough but kept talking about all the luxury cruises and vacations she had been on, including two around-the-world cruises on the QE II, and how this cruise was far inferior to those. She later told us a story about how the QE II had been hit by a 75-foot wave one night. We sat with the same people for dinner the next night. We preferred the buffet dinner to the sit-down dinner, because we could choose a little bit of everything and we didn’t really want waiter service anyway. On Wednesday we spent the entire day at Rhodes. We wandered through the medieval Old Town, saw the Avenue of the Knights, the mosques, etc. The architecture was beautiful but was obscured by the gaudy tourist shops, which had the same cheap knick-knacks we had seen almost everywhere else on our trip. It was extremely hot and humid there, so we retreated back to the ship for lunch and a shower, then went back out in the afternoon and walked around the modern city outside the Old Town’s walls. We saw the site where the Colossus of Rhodes used to stand, where there’s now a column with the stag. The column with the hind had apparently been taken away. I was surprised there was no sign or marker there with a depiction of the Colossus; I only saw it on tourist memorabilia. 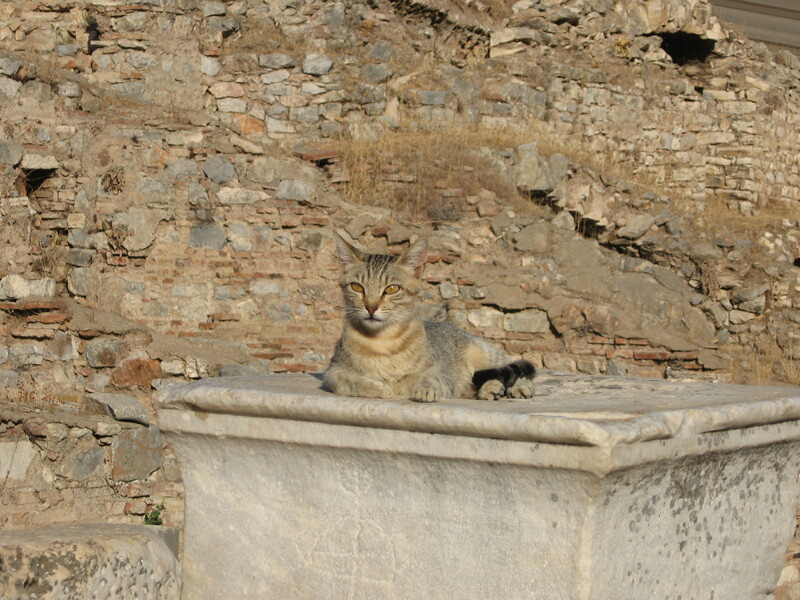 The cats of Rhodes were big and squat and not as pretty as the ones on the other islands. I tried to buy some Greek delight but couldn’t get the merchant’s attention. That night at the sit-down dinner it was elegant-dress night; some people dressed up and we wore nicer clothes than usual. They gave us better food that night, and after the entrée they turned off the lights and all the waiters came out with flaming Baked Alaska, which was really good. Then the waiters got together and serenaded us for a few minutes. On Thursday we went to Heraklion, Crete, early in the morning on an excursion. 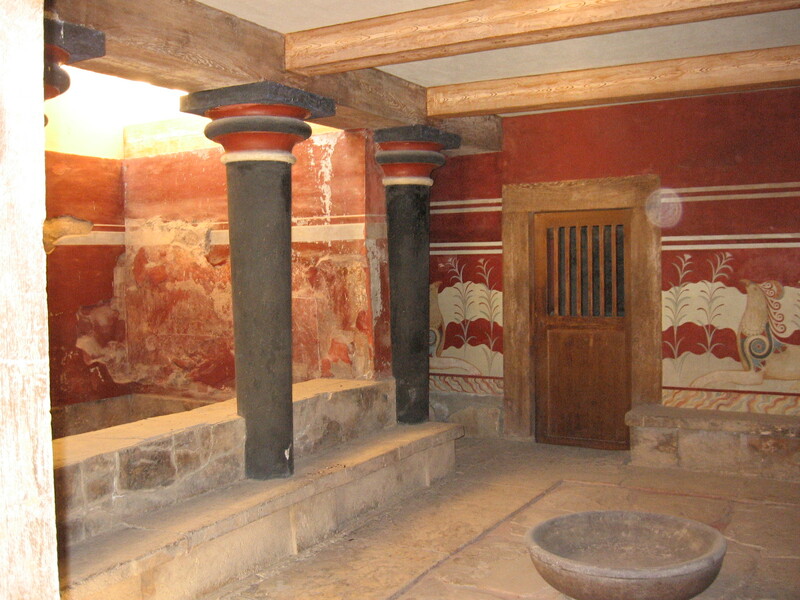 The tour took us to Knossos, which was amazing. The site was larger than I expected. I know the reconstructed portions are controversial, but I thought it really made the place come to life. I bought a book on the site. Throughout the cruise we kept seeing this woman whom we called Zsa Zsa Gabor, because she had clearly had a ton of plastic surgery, with huge lips and fake blonde hair. She always carried around a parasol and asked her husband to take her picture about every thirty seconds. She kept pushing her way to the front of the tour. The only question I heard her ask on the tour was about the signet ring worn by one of the Minoans shown on a reconstructed fresco: “Would they wear that for life?” she asked. The tour guide said she didn’t know. On the whole the guide gave a fairly good summary of theories about Minoan life. After seeing Knossos, we were dropped off in the center of Heraklion, where mom and I ran into the archaeological museum for about twenty minutes. The museum’s under renovation so they only had one room with the most important objects. 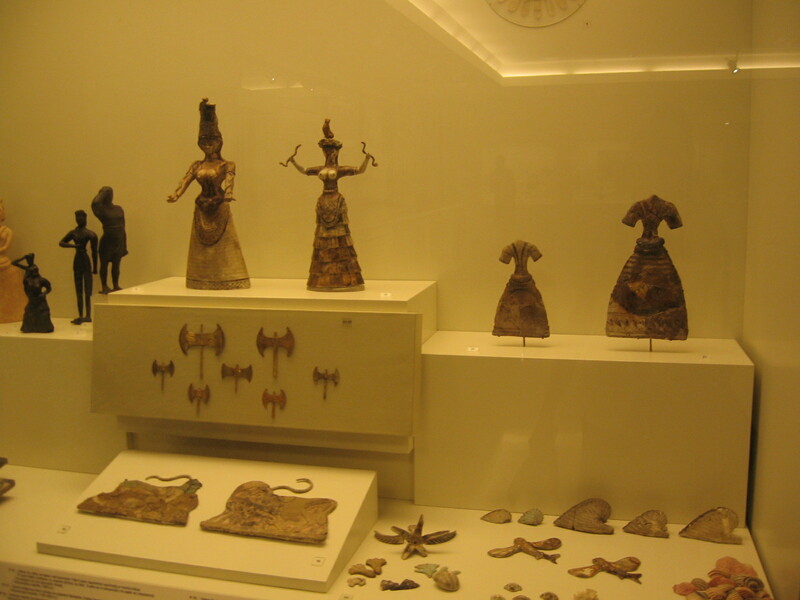 It was amazing to see the artifacts that I had seen hundreds of times in pictures, all in one place – the snake goddesses, the bull’s head rhyton, the Knossian frescoes, the Phaistos disk, etc. I took a picture of every display case. Afterwards we walked down to the Venetian lion fountain in the commercial district, but had to walk right back to catch our bus back to the boat. 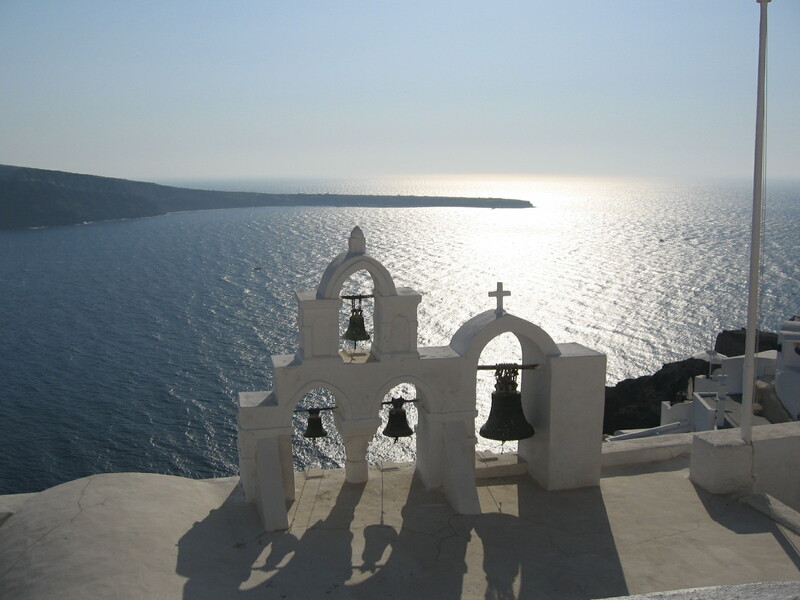 We then went on to our last stop, Santorini. They had to take us on tender boats, which took a long time to organize. We went on an excursion to Oia, about half an hour’s drive away. The bus had to make lots of hairpin turns on a cliff overlooking the caldera. Overall the tour consisted of too much driving to and from places, which was unfortunate given the very limited time we had there. 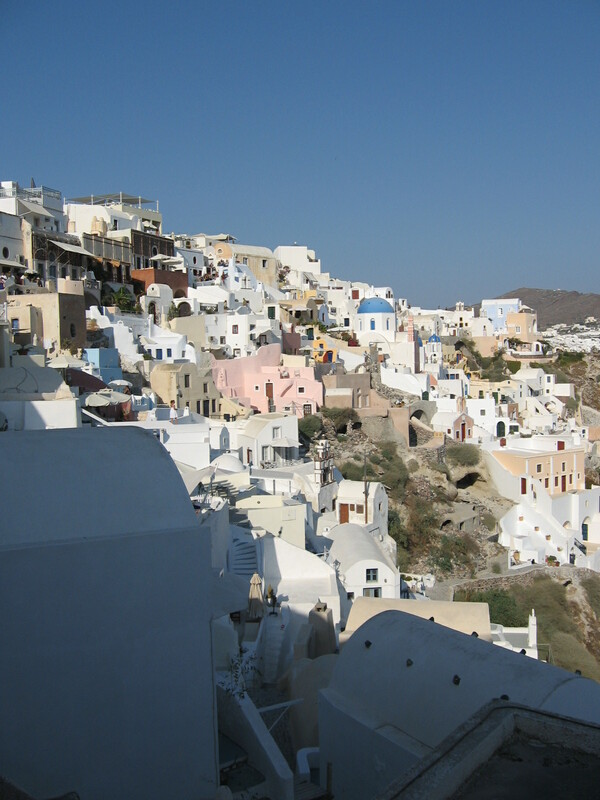 Oia is a beautiful town and the views were amazing, but it was incredibly crowded in the narrow streets. I would definitely want to go back there in the off-season. We saw the sun setting from the town. The shops here are excellent, and Mom bought a silver necklace and lightweight scarf. The saleswoman was British. There were a ton of jewelry shops, seemingly too many for such a small place. We also bought some sweet sesame candies, which were really good. I was surprised I didn’t see as many cats as on the other islands. Then we went back to the bus and drove to Fira, where we were left to make our way back to the tender boat to get back to the Aquamarine. We had been given a coupon for the cable car or a donkey ride, and had been advised not to take the donkey because many people fall off on their way down. We were also told there would be a long line for the cable car, so we went there without looking in any of the numerous jewelry and tourist shops lining the main street. The view of the caldera was impressive, but the town of Fira wasn’t nearly as picturesque as Oia. The tour guide had told us it would take about twenty minutes to wait for the cable car and the same time to walk down the 500+ steps down the cliff, where the donkeys walked. We decided to take the cable car, since everyone discouraged us from taking the donkeys and made walking sound like a dirty and dreadful experience. The line for the cable car was very long and people kept pushing us and cutting in. There were no employees there to keep order. It wound up taking almost an hour to get on the cable car, and we were pretty annoyed by then. We had been told that an Aquamarine employee would be up there to make sure everyone got down in time, but the 8 o’clock deadline passed and there was still no sign of an employee. We stood next to two women from Missouri – a woman with her elderly mother – who were also from our cruise, and we decided that there must be a lot of passengers still on the island and that the ship wouldn’t dare leave without so many people. Finally we got to the cable car platform, and were again surprised that there were no workers directing people and telling us how many should go into each car. But we finally got down and found a tender boat going back to our ship. There was a Filipino officer there from the Aquamarine who made us form a line to get on the tender boat. He looked annoyed and the first thing he said to us was that the people who had walked down the steps were already on the ship eating dinner. This bothered me and I told him that our tour guide had told us it would take twenty minutes to get down by cable car, and we had never been advised to walk down, so how were we supposed to know? Besides, what about handicapped people? The elderly woman we were with definitely could not have walked down or taken a donkey. The man just shrugged and muttered that he had always known it was best to walk down. Perhaps he should have made an announcement to the entire ship, then. I don’t know what the solution is when Fira gets so crowded and all these cruise passengers have to return to their ships at the same time and there’s a bottle-neck at the cable car. I later put a comment in the suggestion box that said we should only go to Oia, since it’s much more beautiful than Fira and probably easier to access. We had a buffet dinner that night which seemed a little worse than the previous nights’. Everyone seemed kind of pissed off that it had taken so long to get off the island and that the buffet was so crowded. We picked up our passports from the ship, which had held them for the last four days. Although the food was generally mediocre, I really liked the fruit carvings that they had the dining rooms throughout the cruise. There was one with a man’s face carved in a yellow melon, and another with a woman’s face carved in a watermelon, along with fish, flowers, etc. That was the end of our cruise. The next morning we docked in Piraeus and got a cab to the airport. Overall it was a great trip, though I didn’t like Greece as much as Spain, France or Italy. The landscape isn’t as beautiful, the people aren’t as polite, the food and shopping have no variety, and it’s hard to get information about things. But the sites are amazing. 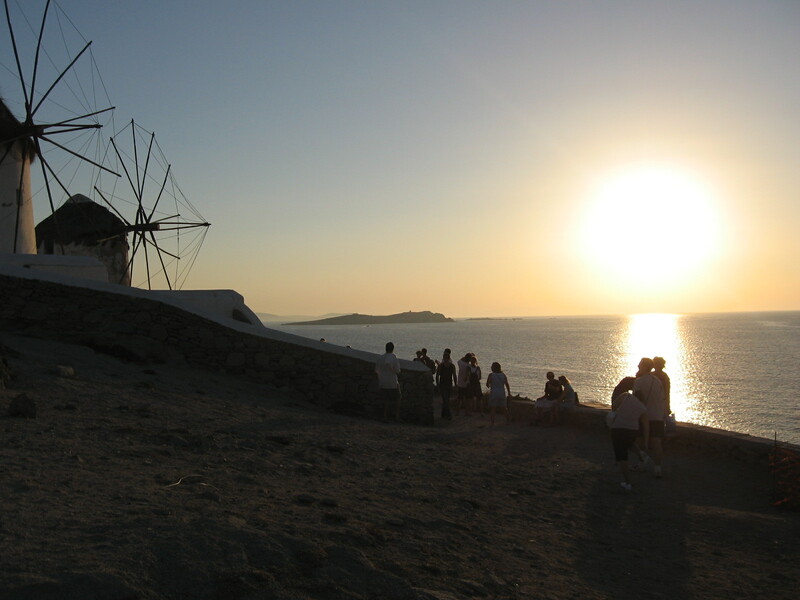 I would like to go back to the Cyclades in the off-season, especially Santorini and Mykonos. It’s still hard to comprehend how many really important sites and artifacts I’ve seen over a very short period of time.